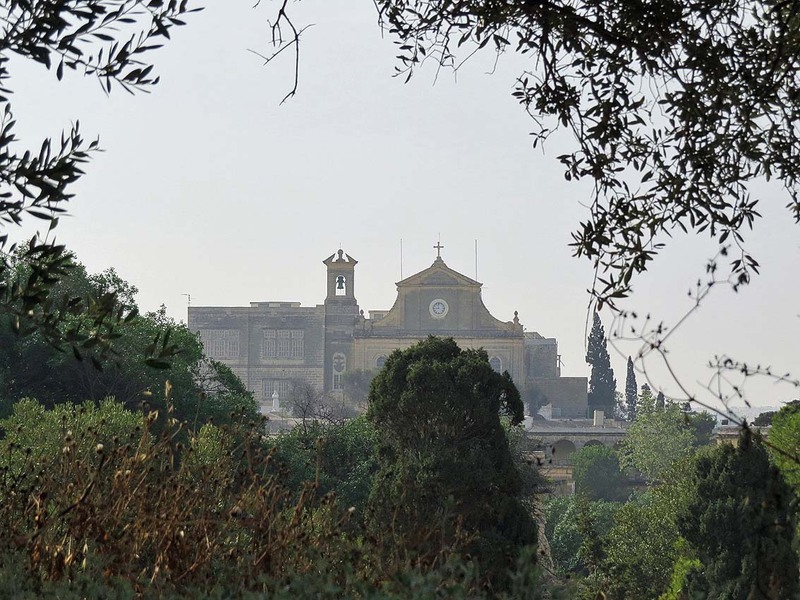 Floriana’s oldest garden is the Mall whose origins date back to 1656. Grand Master Lascaris built this elongated strip mainly as a place where Knights could practice a popular game of the time called maglio but there are many other interesting Gardens to take in. Floriana, Valletta’s immediate suburb, often feels hard done-by by all the attention its more illustrious neighbour gets while everyone else seems to just hurry through its main thoroughfare. After all Floriana is something of a historic town itself and boasts the largest public square in Malta – the space known as Il-Fosos – which has regularly played host to mass events including Papal Masses by both Pope John Paul II and Benedict XIV, concerts by the likes of Elton John and Mark Knoffler, and of course the annual Isle of MTV and Joseph Calleja concerts. Floriana is mainly an administrative centre with various government departments housed in it. Its population is an aging one and the town struggles to attract newcomers despite its advantageous location. Not the least of its attractions are its public gardens – of which it has an abundance for such a small township. Floriana’s oldest garden is the Mall whose origins date back to 1656. Grand Master Lascaris built this elongated strip mainly as a place where Knights could practice a popular game of the time called maglio. A derivative of this game also gave London’s Pall Mall its name. The Mall’s main feature is a number of monuments dedicated to Maltese personalities – one of the most curious being Vincenzo Bugeja, a nineteenth century businessman and philanthropist who apparently made most of his money at the gaming tables of Monte Carlo and was notoriously known in European gambling circles as the Maltese Matador. 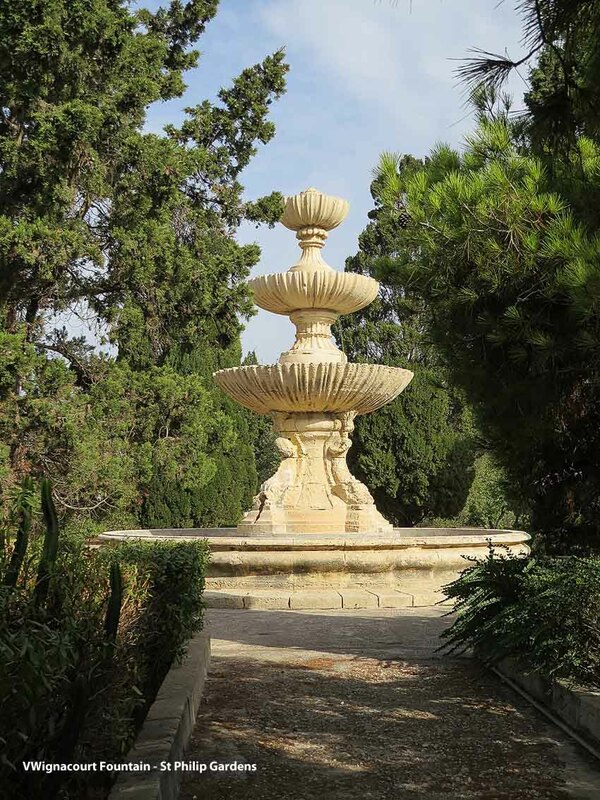 Adjacent to the Mall is the Argotti Gardens – officially Malta’s botanic gardens, with a huge variety of trees and shrubs but perhaps more interesting is its ‘twin’ St. Philips Garden with an easily overlooked entrance just next to Argotti’s. The centrepiece of St. Philips is a monumental fountain constructed by Grandmaster Wignacourt to celebrate the completion of the aqueduct which brought water to the capital. The fountain, originally in St. George’s Square in Valletta, was unceremoniously dumped here by the British who preferred to use the Valletta space for military parades unhindered by watery installations! Over on the other side of Floriana, Luigi Preziosi Gardens hugs the fortifications overlooking Grand Harbour with a landward backdrop of fine townhouses. Herbert Ganado Gardens likewise continues the battlement-hugging closer to Valletta. 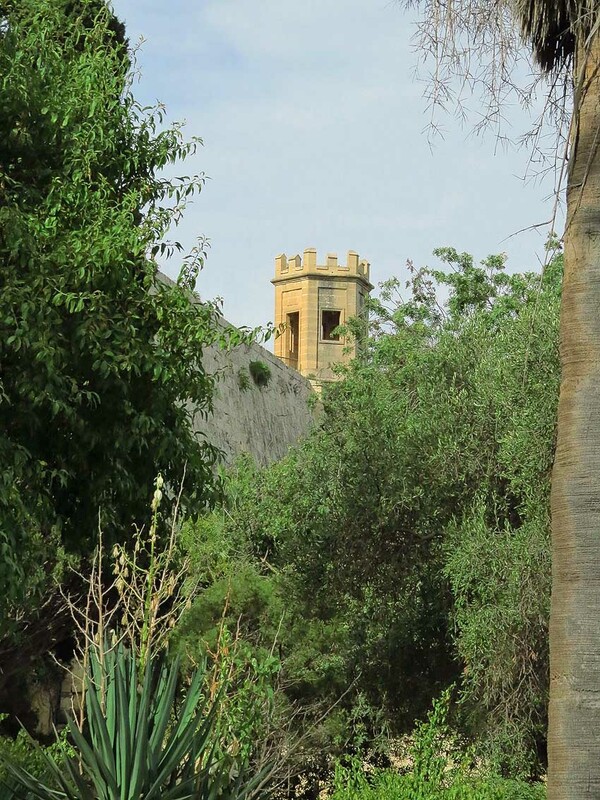 But perhaps Floriana’s most intriguing garden is Sa Maison, on the road to Pieta and overlooking Marsamxett Harbour. Sa Maison uses the confined spaces available between lines of battlements to provide an interesting garden set on five levels linked by ramps and steps. It is a secluded spot even by today’s standards and was reputedly the (understandable) haunt of freemasons in days gone by. Sa Maison has that aura of grand decay – with a series of carved regimental crests adorning its robust walls, most commemorating the regiments responsible for the gardens’ upkeep in the British era. At the far end of the lower level one can see a magnificent skewed arch linking battlements still inaccessible to the public. On the garden’s topmost level is a beautiful gardjola (lookout post) commanding great views of the inner reaches of Marsamxett.